Robots are doing pretty great things these days, but it’s been a while since anyone has really reinvented anything about robot movement. Attendees at the 2009 IEEE, though, got to see some truly incredible new robots. They move at high speeds, are scarily dexterous, and feature crazy-sensitive sensors that let them “know” a great deal about their surroundings. Researchers at the Ishikawa Komuro Laboratory (University of Tokyo) have developed several high-speed bots under the project called Sensor Fusion. The goal of the project is to integrate multiple sophisticated sensors to create higher-functioning robots. Combined with their ability to move at incredibly fast speeds, the sensors let the robots interact with objects in never-before-seen ways. 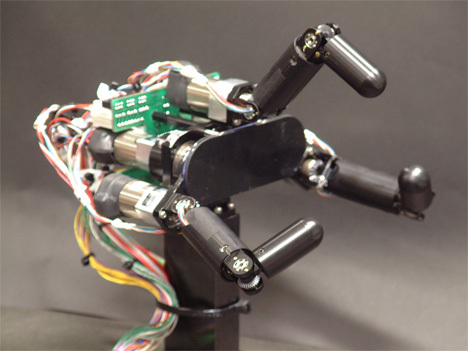 The team has developed dynamic systems that allow the bots to throw and catch objects, tie knots, manipulate tools, dribble balls, and perform feats like twirling pens through their “fingers.” The development of these remarkably accurate high-speed systems basically opens up countless new worlds in robotics, though we have to admit that this high-speed multi-sensory technology coupled with the agile mobility of Big Dog could potentially (read: probably does) spell the end of mankind…and soon. See more in Robotics or under Technology. November, 2009.